In this video, Mark Donovan of HomeAdditionPlus.com demonstrates Rockwell Tool’s JawHorse Sheetmaster, a portable workstation designed for the jobsite or home workshop. He also discusses its unique benefits and the various applications for it. The JawHorse Sheetmaster is ideal for both the contractor and the diy homeowner. It can function as a work bench, a saw horse, a stand, and a vice. Its sturdy construction is perfect for any contractor jobsite and its compact footprint makes it ideal for any homeowner’s garage or basement workshop. Clamping building material in the JawHorse Sheetmaster is a breeze. The steel jaw clamp is 8 inches in width by 3 inches in height with rubber surfaces on each side of the jaw, giving it tremendous gripping surface area. To hold something firmly in the jaws, you simply place the material on top of the Sheetmaster work surface and step on the integrated foot pedal to clamp the material into place. Each stroke of the foot pedal ratchets the JawHorse Sheetmaster jaw clamp tighter by 1 inch. Once the material is clamped in tight, a simple locking switch holds the clamped material firmly in place. Additionally, a separate leg bracket accessory is included to work in conjunction with the JawHorse Sheetmaster and a couple of 2x4s to support large 4’x8’ sheet materials. The JawHorse Sheetmaster is extremely easy to assemble as it comes as a single unit. Simply turn the JawHorse upside down, release a latch mechanism on the foot pedal, and then stretch the three legs out until they lock into place. The forward leg requires one knob to also tighten. Finally, turn the unit over and stand it up on its legs and its ready for use. Teardown is also a breeze. Again turn the JawHorse upside down, slide the latching buttons to unlock the two back legs, loosen the knob for the front leg, and then simply fold up the legs. It really is as easy as 1-2-3. When folded up it fits into a compact footprint of 37-1/4” in length x 14-5/8’ in width x 13-7/8” in height. The JawHorse Sheetmaster is more heavily constructed than the original JawHorse to give it the strength and stability to support large 4×8 plywood sheets. 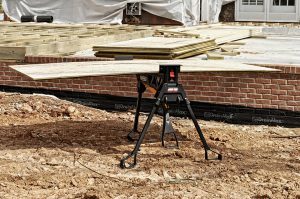 It’s constructed out of powder coated heavy gauge steel and includes a wide stance tripod design, with large rugged non-slip feet. Consequently it weighs in at 53 lbs, about 10 lbs heavier than the original JawHorse. This said, Rockwell Tools did an excellent job in modifying the original JawHorse portability design feature to support this heavier model. By integrating inline skate-type wheels and a hand grip into the front leg, which can double as a pulling arm, the Rockwell JawHorse is easy to wheel around on most jobsite and home floor / terrain surfaces. The JawHorse Sheetmaster is reasonably priced and several additional accessories, such as a tool tray, saddlebag, welding jaw, and a log and chainsaw jaw, can be purchased separately. It can be purchased directly from Rockwell Tools at www.Rockwelltools.com, other shopping websites, and from various local retail stores. So if you’re in need of a rugged, portable and flexible workbench, that can support wide and heavy items, make sure to check out Rockwell Tool’s JawHorse Sheetmaster. It’s the perfect tool for effectively providing another pair of hands while cutting plywood or other sheet building products.